“We eat everything, and the main condition is that it should be quick and filling to keep us full for a longer time,” explains this group of friends when asked why they choose street food. 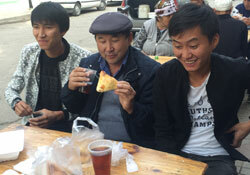 New research from WHO conducted in Kyrgyzstan and Tajikistan has found that street food commonly sold in these countries contains high levels of salt and trans fat. Consuming excess salt and trans fat on a regular basis increases the risk of noncommunicable diseases (NCDs), including coronary heart disease, hypertension and stroke. Street food brings great benefits to communities by retaining a place for traditional dishes and supplying healthy parts of a diet such as fibre-rich fruits and vegetables. However, the recently launched reports show that some of the dishes surveyed in the 2 countries contained up to 124.5% of the maximum recommended daily intake of salt; others provided 170% of the maximum daily intake of trans fat in one serving. These findings apply to both traditional foods prepared onsite at markets and processed foods that are widely available as street food. Street food plays a unique and important role in the food culture of many eastern European and central Asian countries. Generally inexpensive and convenient, food sold in informal street settings and around markets makes up an important part of the daily diets of many people. Yet very little research has been done on this type of food. Previous studies on street food have primarily focused on food safety rather than nutritional content. The WHO/Europe FEEDCities project aims to fill this gap by capturing data on food availability and composition in urban settings, and by looking specifically at trans fat and salt content. These types of data are being collected for the first time in many of the countries surveyed. The reports on Kyrgyzstan and Tajikistan underscore the need for policies to improve the nutritional quality of street food in order to stem the tide of diet-related NCDs. WHO will work with these and other countries to interpret findings and develop recommendations for an appropriate response to help minimize the negative health impacts of the food on offer on the streets and at markets in central Asia, the Caucasus and south-eastern Europe. Growing urbanization and the globalization of processed food has resulted in dietary changes worldwide, with an accompanying rise in the consumption of processed foods that are energy-dense and rich in fats, sugar and salt. FEEDCities is an ongoing multicountry initiative coordinated by WHO/Europe that attempts to describe the urban food environments of cities in central Asia, the Caucasus and south-eastern Europe. To date, it has completed field work in 6 countries: Bosnia and Herzegovina, Kyrgyzstan, Kazakhstan, the Republic of Moldova, Tajikistan and Turkmenistan. The results from Kyrgyzstan and Tajikistan are the first to be published.